End of June 2018 Rovsing delivered a full Power SCOE (Special Check Out Equipment) to Thales Alenia Space Italy after being refurbished and passing full acceptance testing at Rovsing. The system was originally produced by Rovsing for Sentinel 1 A&B where it has been used successfully for both satellites. The system is a full Power SCOE consisting of six racks covering various essential functions. 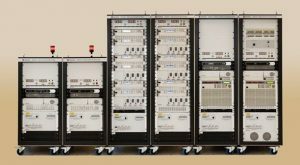 This includes a battery simulator and pyro simulation rack, a battery conditioning rack, two solar array simulator racks and two launch power supply racks. In total more than 3 tons of hardware was shipped to Thales Alenia Space, ready for another 10 years of use. After successful inspection at Thales Alenia Space the system is now ready to support the test and launch campaign for the Sentinel 1 C&D satellites. For more information about Rovsing’s Turn-key System Solutions or other products and services, please contact us at info@rovsing.dk or call +45 44 200 800.